***We have been with VRBO since 2003 and have always had positive feedback from our guests. You haven't enjoyed beach living until you have stayed in our wonderful condo! Please check out our video by clicking on the VIDEO BUTTON at the top of the featured picture. Absolutely breathtaking view in Panama City Beach's most elegant beach front condominium, En Soleil. Inground parking, total indoor access and only three units per floor with each floor having it's own climate controlled lobby area. This unit is perfect for two couples to share or for grandparents and parents with a young child or two in the bunkies. If you would like to see more photos than the ones on this site, they can be emailed to you easily but do check out our video clip. This 2 bedroom unit has 1695 square feet of luxury indoor living space plus a 25 x 12 tiled and covered balcony with it's own stainless steel gas grill and tiled work surface. In addition to it's spaciousness, this balcony is totally private and is the perfect outdoor living space. The fact that the balcony is covered and private make it so very useful and comfortable for 'dining-out' as well as sitting and enjoying the beautiful sunsets each evening. The unit is beautifully decorated with travertine floors throughout, ample cupboards in kitchen and light colored silestone countertops and storage galore in bathrooms. Both bedrooms have patio doors to the balcony, huge picture windows overlooking the Gulf of Mexico, TVs with cable and DVDs and well-appointed bathrooms. One bedroom has a king size bed with separate travertine open shower, jetted tub and walk-in closet. The other bedroom has a queen size bed plus the greatest bunk closet with a TV with cable set to go for video games and earphones, truly unique! In addition this bedroom has ample closet space and attached full bath. The main rooms; dining, living and kitchen with bar counter are all open and very spacious. There is a gas fireplace, surround sound TV, DVD and CD, 2 patio doors to the balcony and all are over looking the beautiful Gulf of Mexico and white sand beach! The gourmet style kitchen is fully equipped and has all stainless steel appliances, convection/microwave oven, refrigerator with water and ice maker/dispenser and cooking range/oven with multi-functional cooktop. There is as well a large separate laundry room with full sized washer and dryer and again many storage cupboards. The unit is comfortably and stylishly furnished with a French Country touch. The owner has furnished it for their own use and comfort. The En Soleil condominium has only 88 units in two 15 story buildings and only a small percentage are rental units. The upscale pool area has 6,500 square feet of exclusively designed pools, two hot tubs, two grand waterfall features and two circular waterfall fountains. There is a fitness center as well as 24 hour security. This is truly a luxurious building and condominium unit. You will fall in love with it as we have! This unit sleeps 6 adults (1 King, 1 Queen and a sofa sleeper) plus a bunk closet with two bunks in the second bedroom. It is perfect for two couples, grandparents, parents with one or two young children or a family. Please note this is a non-smoking unit and no pets are allowed. We are a retired couple who enjoy our home away from home during the winter months and love to have others enjoy it during their vacation time. We take great pride in our condo and try to make sure it is aways in great shape for our guests by doing maintenance twice a year in the spring and fall. We love to travel and have been to many beaches but honestly know this is by far the best beach anywhere we have been in this world. En Soleil is the prime condo complex in Panama City Beach with friendly and helpful staff who take great care of the Property. Many who have enjoyed it say they would not stay anywhere else when in PCB! The location is terrific, close enough to everyhting but not crazy busy as PCB can be at times. The beach out front is spectacular!!!! Both of our parents wintered in this area and we have fond memories of enjoying good times here with them and now we are enjoying time with our own family in PCB. Our condo is the perfect oasis for people to enjoy, the beach, a BBQ on the largeand private balcony or just to relax and read a book. From inside you feel like you are on a cruise ship looking out to the sea, absolutely nothing but a vast spanse of the gulf. The layout makes one feel like they are in a bungalow overlooking the Gulf of Mexico with no one else to concern about at all. The open layout alos makes it feel very airy and comfortable. There are two full baths both en suite to bedrooms. The master ensuite has a huge walk in shower and jetted tub. There is a hair dryer available. The Beach is at your door! One designated garage parking spot #11 close to elevator to condo. 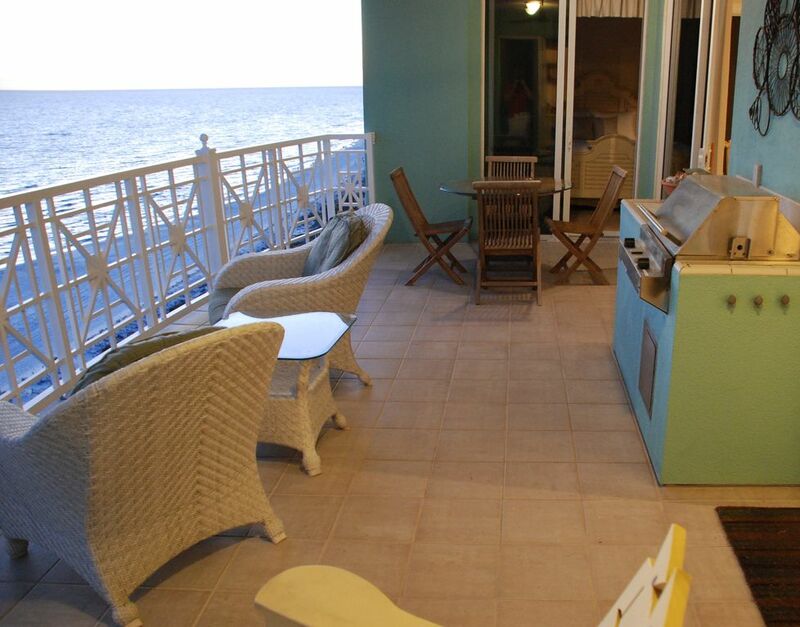 Comfortably furnished for Gulf viewing, TV watching or relaxation. Large 12 by 25 tiled balcony for eating, grilling, relaxing, reading or viewing the beautiful Gulf and it's fabulous sunsets. Thanks Paulette and I am so pleased you enjoyed your stay. This was the easiest transaction ever, Debby-Ann helped me every step of the way and the condo is perfect. Smooth check-in and check-out and everything in between was terrific. I would deal with her anytime, highest marks for the condo and the owner!!!! Thanks! So happy everything went well with your stay in our beach home. I can't say enough good things about En Soleil! This was our second trip and there will be many trips back in the coming years! The condo is beautiful, spacious, and feels like home. When you first enter, you are immediately engulfed by the stunning ocean view and soothing sounds of the waves. Access to the pool and beach are quick and easy and the pool/building are managed beautifully by the attentive and helpful staff. This condo holds our family of 4 very easily with space for all. But there is plenty of room if grandparents want to join! The washer/dryer are very convenient for keeping towels and suits clean and dry. And the grill on the balcony is fantastic - no more taking an elevator up from the communal grills and eating cold dinners! En Soleil is perfectly located; very close to the activity and bustle of downtown PCB, but just enough off the strip to be quiet and uncrowded. You will not regret spending your next vacation here! you and your family return to enjoy our beach home again. The owner of condo was wonderful to work with and was quick to respond to any questions. She also accommodated getting us extra days, which was super. The condo and property are wonderful. Great to have others enjoy our beach home! Absolutely a perfect Condo, truly loved our vacation week! What a wonderful vacation experience in this Condo. We have found our new "vacation home away from home" . . . this condo! The Condo owner could not have been more helpful and informative, as well as pleased to share their Condo home, which made us feel very welcomed. The Condo is absolutely beautiful, everything about it was perfect. My husband, myself and adult daughter enjoyed a week's vacation at this PERFECT Condo. En Soleil is beautiful and the pool is absolutely unbelievable. En Soleil staff and security where always helpful and very pleasant. En Soleil was EXTREMELY clean, quieter, secure and the Condo accommodation was outstanding and ever so enjoyable. Hope this review can express how perfect everything was with this Condo and En Soleil. We look forward to a return visit to this Condo, we only wish it could be next week again! To the Condo owner, THANK YOU for opening up your lovely Condo home. We are always pleased to share our beach paradise!